[T]here is no more complete and carefully considered work addressing the weaknesses in the current executive pay process. In a true tour de force, Bebchuk and Fried march relentlessly through one form of executive compensation after another, advancing a consistent story of how management influence taints and distorts the compensation process. Bebchuk and Fried have written a provocative and important book on executive compensation. Like Thomas Paine's Common Sense in an earlier era, Pay Without Performance is a terse manifesto for our age of manager's capitalism--a crystal clear and dispassionate, but ultimately devastating, analysis of how our deeply flawed system of corporate governance has led to grossly excessive executive compensation. This is a book that must be read, not only by any citizen who cares about sound corporate governance, but by any citizen who cares about our society--the best book that I've ever read on the subject. Bebchuk and Fried, careful scholars of the first rank, develop a compelling critique of the market for managerial services. Pay is decoupled from performance. Executive compensation is neither fair nor efficient, operating as much on stealth as on open negotiation. Their evidence, their conclusions, and their recommendations cannot be ignored: they should be studied by boards, courts, the SEC-and anyone who wants contemporary corporate governance to work. According to [the arm's length bargaining] model, a potential CEO and the company in search of an executive will strike a rational bargain . . . Bebchuk and Fried assemble an array of evidence to suggest that cozy deals between CEOs and their boards get in the way of this admirable rationality . . . Pay without Performance is ably written, thoroughly researched and intelligently argued throughout. Bebchuk and Fried have written a superb book. It will benefit academics and non-academics alike, and shed much light on the great executive pay debate. ..[B]rave and correct ... well-written, well-researched ... and strongly grounded in empirical and historial evidence. If one has time to read only a single book about corporate governance in US publicly traded companies, this is the book to read..
Pay without Performance... fulfills its promise of providing a thorough description as well as the foundations of a normative framework of the problem of top executive compensation. ..[A]n important contribution to the continuing discussion about corporate governance. it will repay a careful reading, and it is likley to acheieve the influence it deserves to have. The most important change in corporate structure in the United States has been the shift of authority from stockholders and their directors to management. From management authority comes control of management compensation. That this should be generous, even lavish, and with no necessary relation to performance, is the reality of modern economic life. This literate and learned book is for all who wish to learn the facts and consequences. --John Kenneth Galbraith, author of The New Industrial State, The Great Crash, and, most recently, The Economics of Innocent Fraud. Bebchuk and Fried argue persuasively that executives of large companies have immense power, and that they use this power to pay themselves large amounts that are insufficiently related to performance. Nobody who reads this book will feel quite the same about Corporate America again. “[A] timely, thoughtful and provocative book that is bound to become influential”. A profound and insightful analysis of the crisis in executive compensation. Defenders of the status quo say that such bloated pay provides managers ... with incentives crucial to high performance. Those defenders have not yet read Lucian Bebchuk and Jesse Fried's Pay Without Performance. The authors marshal a formidable arsenal of facts to pick apart the incentives argument, exposing myriad ways in which CEOs have decoupled pay from performance and hidden that fact from investors with the aid of supine corporate directors. The lucidly argued treatise frames the issue not in ethical terms but as a problem of efficiency. Because I read SEC filings every day for my blog, I know just how spot-on Lucian Bebchuk's and Jesse Fried's Pay without Performance really is. --Michelle Leder, author of "Financial Fine Print", Across the Board, May/June 2005. Lucian Bebchuk and Jesse Fried have brought to light one of the most important issues facing our society today. I agree enthusiastically and almost completely with their analysis of the problem. Lucian Bebchuk and Jesse Fried identify many of the causes of the current compensation crisis. --Jay Lorsch, Harvard Business School, Across the Board, May/June 2005. [A]n important book that should help to get the academic profession thinking in a new direction. 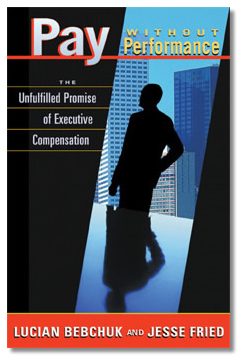 The supporters of the conventional model of compensation clearly have a case to answer, and this book makes it plain what the challenges to developing a better understanding of executive compensation are. -- Ernst Maug, University of Mannheim, Journal of Institutional and Theoretical Economics. This book scares the hell out of you because it gives you the best insight into how super-CEOs exploited the system of executive compensation in the US. [T]he best book published in 2004 in the field of corporate governance . . . It should be required reading for every fund fiduciary, SEC board and staff, as well as all members of Congress. Shareholders should read while sitting down. Book of the year . . . This outstanding book makes a compelling case that "flawed compensation arrangements have been widespread, persistent, and systemic" . . . Clear writing, well-chosen examples, solid research, and exceptionally astute analysis make this an indispensable resource for investors, executives, directors, compensation consultants, and human resources specialists. This book has important messages about where that balance should lie, not just with regard to executive compensation but go governance in general. Impressive in scholarship, impeccable in timing, and accessible in style, this book deserves the attention of academics, policy makers and long-suffering investors. [F]ascinating and complex . . . Bebchuk and Fried's compelling book clearly shifts the burden of proof to the opponents of corporate governance reform. Well worth reading! For anyone looking for a guide to the debate over American top pay, this book will be indispensable. It is clear, well-argued, fully researched and deeply felt. Bebchuk and Fried present a powerful challenge to financial economists' view that compensation arrangements are designed by boards seeking to increase shareholder value. They offer a compelling account of how managers' influence has distorted executive pay. By showing how boards have failed to guard shareholder interests, Bebchuk and Fried raise fundamental questions concerning our corporate governance system and lay the ground for their proposed reforms. Their work will shape debates on executive compensation and corporate governance for years to come. "Just as when others have attacked strong beliefs and a well-developed canon in the past with new and strong evidence..., the guardians remain convinced otherwise. But the strong evidence eventually prevails, and to me, the evidence that Bebchuk and Fried are right is more than convincing." Lucian Bebchuk and Jesse Fried offer a devastating critique of the way public companies pay their top executives. Relying on data rather than rhetoric, Fried and Bebchuk describe a diseased system in which executives wield enormous influence over their pay .... [T]hose looking for a substantive deconstruction of the system -- and a few ideas to fix it -- could hardly do better.". [T]he most comprehensive, closely argued, and devastating . . . critique on executive compensation. . . . will be -- at least should be -- studied by those who believe that our corporate system, which currently looks out of control, still has a future. What's remarkable about Pay without performance, and which may give it more impact than other books on executive pay, is that it is not an angry creed but, rather, a studied, scholarly analysis whose understated language gives it a cumulative effect that is overpowering. Lucian Bebchuk of Harvard and Jesse Fried of Berkeley set out to identify the failure of corporate governance that allows chief executives' compensation to carry on rising with little relation to performance. They point the finger firmly at board directors. Lucian Bebchuk and Jesse Fried in their in their devastating new critique of U.S. corporate remuneration and governance...pick apart the nasty tangle of conflicts that ensure CEOs' sway over their own pay.